Happy Fri-YAY out there, everyone! Glad you could join us. Unfortunately, also joining us will be the full brunt of summer as sweltering heat and humidity dominate the weekend. I want you to pretend the word hot up there has steam coming off of it. You know, for illustrative effect. We’ve gotten the rain out of here, which is the good news, but we’re replacing it with some of the hottest temperatures we’ve dealt with this year. Upper ridging aloft is promoting high pressure at the surface and it’s coming with southwesterly winds, so buckle up and crank the A/C. After a bit of patchy fog this morning, sunshine should begin to take over from the cloudy skies we had yesterday and that will allow temperatures to approach the 90º mark this afternoon. 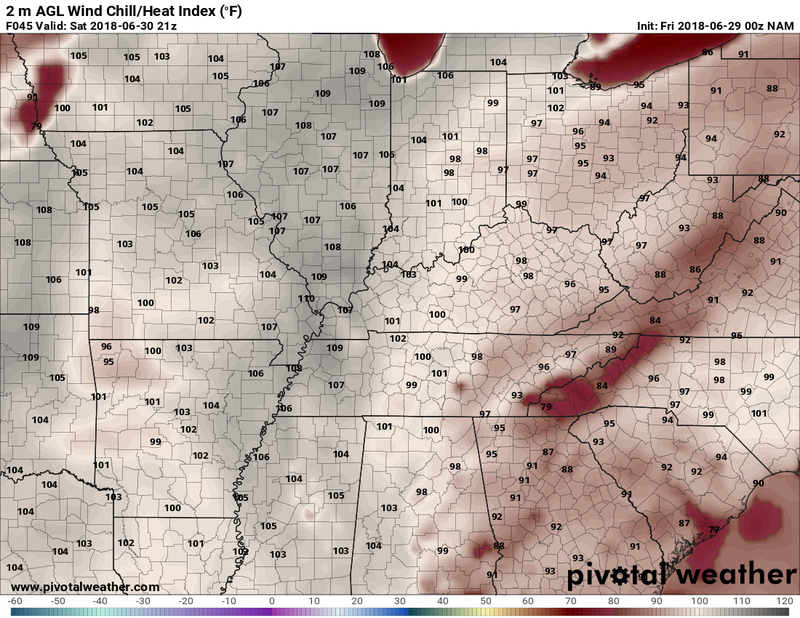 Combine that with dew point values between 70-75, that will give us a heat index closer to the 100º mark this afternoon. In fact, the National Weather Service has gone ahead and issued a heat advisory for this afternoon and early evening. At this point, it only covers Butler and Warren Counties because those are the only counties they expect to hit heat advisory criteria. 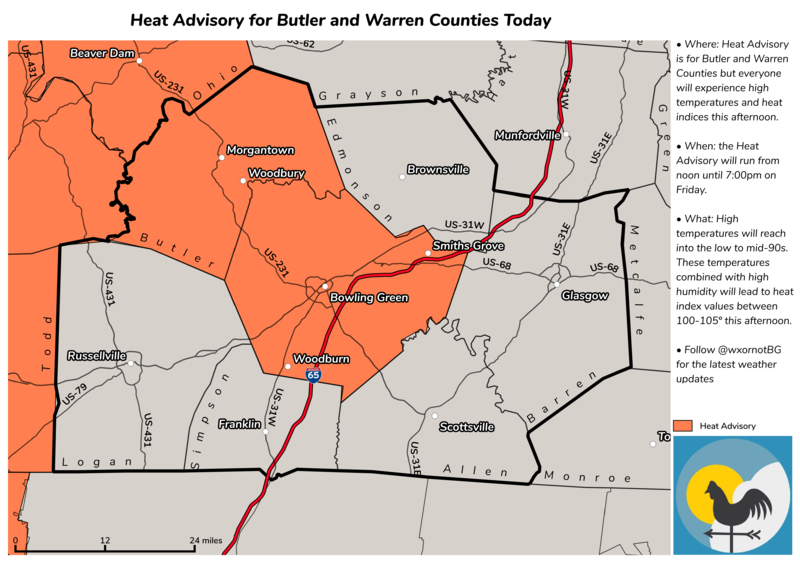 A heat advisory has been issued for Butler and Warren counties until 7 pm this evening. Mostly sunny skies will give way to mostly clear skies as day turns to night, though we only fall down to a low of around 75º. It’s not going to get any better for Saturday…in fact it’s going to get worse. Upper ridging will get more dominant over the region, and with mostly sunny skies continuing, we’re talking scorching numbers closer to the 95º mark. Dew points stay firmly in the “just stay inside” category of around 75º. 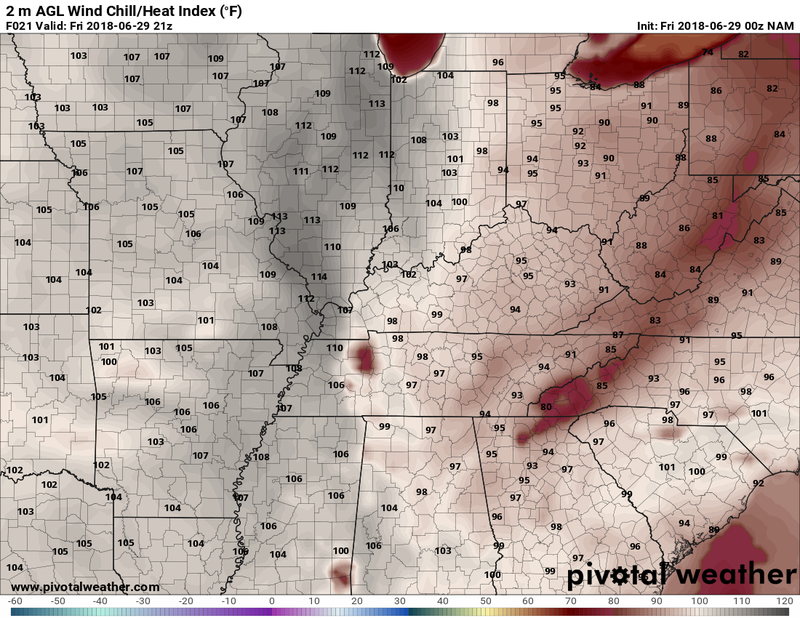 This means heat indices in the hottest part of the day will once again be around 100-105º. This can be dangerous stuff, folks. If you can stay inside, do so. If you have to be outside, try to either be in a pool (with an appropriate amount of sunscreen of course) or finishing your outdoor activities in the coolest part of the day. Drink plenty of water and take frequent breaks, as well. Check on the young and the elderly, the most vulnerable groups to this kind of heat. And as always, if you’ve got the young or the furry members of the family out and about…do not forget to check the back seat! We’ll only fall to about 75º again overnight. Sunday is mostly going to be a repeat of Saturday, but with a slight exception…a storm? The high pressure over us that’s been providing us with the sweltering weather will start to break down a bit on Sunday, allowing us to pop a storm or two during the heat of the afternoon. Nothing major, but it will be a nice cool down from high temperatures in the mid-90s if you manage to get under one. Otherwise, more of the same will continue into next week. Summer will continue to make it’s presence known, in a big way. That just about does it for me! Follow our live weather feed @wxornotbg for the latest. 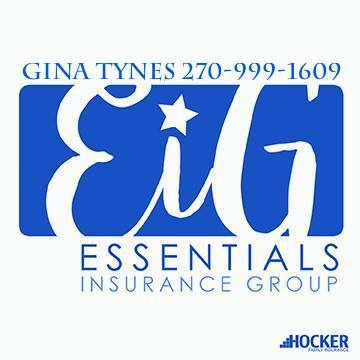 Have a terrific Friday and stay cool!